We are pleased to announce the winners of the CMP-CCNet 2018 Adaptive Management Case Study Competition, our second competition designed to promote cross-organizational, cross-project, and cross-coach/practitioner learning in conservation! We received some excellent entries. 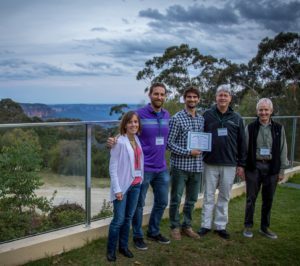 After crowd-sourced voting, our judges (Rob Sutter, Ian Dutton, Rachel Neugarten, Daniel Sprod, and Dave Kramer) selected the final three winners and announced them at the 2018 CCNet Rally in Australia’s Blue Mountains. Congratulations to the winners, and a big thank you to all who participated and shared your rich experiences! Tomás Saratscheff, Fundación Legado Chile (in the middle) receives the 1st place prize on behalf of Corporación Nacional Forestal de Chile, with judges David Kramer and Robert Sutter, CMP board chair Caroline Stem, and CCNet chair Brad Northrup. Photo by Felix Cybulla. First Place awarded to The Road Traveled in Chile: Lessons and Challenges in Strengthening Adaptive Management in a National System of Protected Areas. This inspiring entry won handsomely, showing good implementation of the Open Standards at multiple scales and providing an excellent overview of the issues involved in making OS the core planning process. It also demonstrated a successful change in organizational culture, with the competition’s “crowd-sourced voting” swamped by enthusiastic Chilean staff and colleagues. (Award: up to US $2,000 toward participation in a conference/technical meeting). The competition was tough, and two other strong projects merit an Honorable Mention. An impressive effort from Bat Conservation International, From Great Conversation to Great Conservation demonstrates that the Open Standards can be deployed across an organization with sufficient management will and funding. This is a great example of learning by doing throughout the training process. The case study focused on very early steps in the OS and does not yet have lessons learned regarding specific actions. We hope to hear more over time! Whilst still in its early days, the very promising USAID Learning Group Explores the Effectiveness of Enterprises as a Conservation Strategy demonstrates a highly scalable approach. With a deep initial investment in developing a generic Theory of Change and extensive evidence gathering, USAID has created a robust framework for systematic learning. As conservation enterprises lie at the core of many bilateral and multilateral conservation and community development investments, it is critical to understand the conditions under which they are effective or not effective and why.